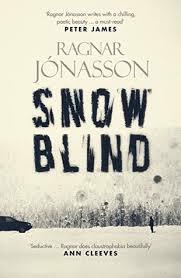 BleachHouseLibrary.ie: "Snow Blind" by Ragnar Jónasson. Young policeman, Ari Thór Arason, takes a post in a small fishing village in Northern Iceland. Work is scarce and he has to leave his girlfriend behind in Reykjavik to begin his new career. Feeling overwhelmed with the relocation, he struggles to find momentum in a a village inhabited by long term residents who are amused by his 'outsider' status. The icy atmosphere is not just because of the weather. Within days of his arrival, Ari Thór is investigating the death of an elderly writer who has apparently fallen after one drink too many. As the policeman interviews the members of the local amateur dramatic society, he begins to doubt the fall was an accident. In a close-knit community, it is proving hard to break the icy shell that seems to protect the locals, but he is determined to try. A woman is then found, badly beaten and close to death, in her snow filled garden and the town is shocked. The investigation leads Ari Thór deeper into the lives of the locals, and secrets become unburied, slowly but surely. While daylight remains hidden behind a blanket of snow, and the town is cut off from the rest of the country, a killer remains within reach. But can Ari Thór convince the residents that it could be one of their own people? Icelandic Noir is a new genre for me. Similar to Scandinavian Crime Fiction, it is dark, atmospheric and razor sharp. Ragnar Jónasson is already a huge success in Iceland and this is the first of his novels to be translated into English. The debut is first in a series and has been treated with care by experienced translator, Quentin Bates, himself a crime writer. While some translated works are lacking in something, this is not the case with Snow Blind. Firstly, this is a damn good story. The small town mentality juxtaposes with the vastness of the landscape and lends an eeriness to the overall narrative. Secondly, the descriptive passages are stunning. Iceland is not a place I have visited, but after reading this novel, it is a place that will haunt my thoughts for a long. long time. The blinding white snow, the crunch of footfall, the muffled hush of the landscape and the closed-in feeling of isolation. The complete opposite of a desert island or a city awash with people and traffic. Thirdly, the author has described small town mentality with immaculate perception. A 'blow-in' can be seen as exactly this for many, many years. Sometimes decades. They are never really trusted completely, and will always feel on the outer margins of their small society. Ari Thór is a likeable protagonist. Young enough to be enthusiastic, clever enough to rise above bullying and yet smart enough to question his surroundings. He feels the white, chilly atmosphere on a daily basis but puts his feelings aside to concentrate on the job at hand. He is aware that his presence is not automatically one that demands respect, rather one that needs to prove itself as a valued member of the community. The prose is delightful with moments of exceptional clarity. "Ari Thór glacned quickly out f the window before they were back on the office. It was still snowing. This peaceful little town was being compressed by the snow, no longer a familiar winter embrace but a threat like never before. The white was no longer pure, but tinged blood red. One thing was certain. Tonight people would lock their doors."